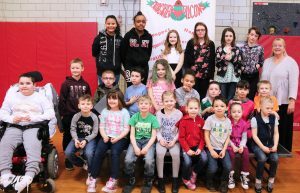 Fairgrieve Elementary students who never gave up through recent challenges were rewarded with the school’s Virtue of the Month honor during a recent Morning Express program. Fairgrieve Elementary School perseverance award winners show off their smiles and brag tags, as Principal Jean Sampsell, top right, stands in a show of support. For their efforts with perseverance, students received “brag tags” to add to their collection, as well as applause from peers, teachers and special guests. Principal Jean Sampsell told the student body that perseverance is an amazing quality that all can endure. “Those efforts help (you) to be successful,” she said. Honorees in the front row, from left, include: Brian Santiago, Kaydon Lenz, Olivia Starks, Francis Davis, Peyton Engel, Kairi Yager, Cavin Jordan, Oakley France and Zoey Miner. In the second row, from left, are: Wyatt Bowering, Donavan Oatman, Aden Bentley, Taryn Murphy, Malayah McCloud, Braydon Richardson-Heaney, Alea Runge and Justin Foley. In back, from left, are: Dominique Bentley, Janai Nunez-Lopez, Allison Treneer, Angelina Ferro, Dayah Crowson, Kelsey Draughn and Principal Sampsell. The song’s strong message detailed completing a task, falling and getting back up again.